Since the core M runs quite hot i’d like to do the heatsink mod, however i’m not an expert and the only times i’ve opened my notebook i’ve simply dusted the fan. I’ll probably stick to connecting the copper heatsink to the rear lid with a thermal pad, it’s a good idea? And how thick should the thermal pad be? And since i’m here are there any news on the wireless card problem? Hi, if you remove the copper lid on the right side, there is already a termal pad covering the core-m3. Is it right to assume that a larger-sized M.2 drive can’t be installed in this laptop because of where the slot is positioned? Is the thermal pad underneath the copper shield a silicone one and if so then would replacing it with a copper shim improve thermals/performance? Not tested, but probably you can install a 2260 M.2 unit. For sure 2280 m.2 will not fit. Regarding the thermal pad, is a silicone one. Great, thanks. 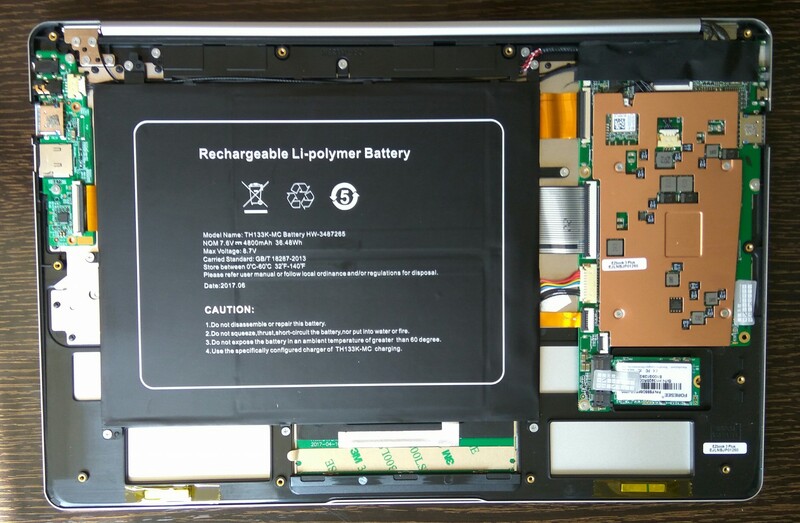 Do you know if there is any copper on the interior of the bottom casing or is it just the same casing as the other EZBooks 3’s? My current plan is just to remove the copper shield, place a shim and some MX-4 on the CPU die and then re-use the silicone thermal pad on the top of the copper shield in the area that’s circled in your picture. Do you think that would offer any improvement? I think that’s where the idea came from however he was working on a different laptop/chipset at the time. Information/guides for the EZB3 Plus seems a little rare tbh. If you plan on doing any gaming on it then I think the cooling will definitely need some work. Mine was hitting above 90 degrees running Skyrim SE tonight and that’s in the cold of winter. The performance on standard Skyrim is absolutely fine, even at 1080p. I’ve had to tweak SE to get it to run at a stable 30 though but I doubt the high temps are helping much at the moment. I was hoping the copper shim I ordered last week would be delivered over the weekend but unfortunately it wasn’t.